Through its centres, CEU promotes all types of projects on social action and volunteering. Its aim is to promote and channel social actions projects with members of the education community to help people living in situations of poverty or social marginalisation. It also aims to promote understanding and awareness in the educational community. 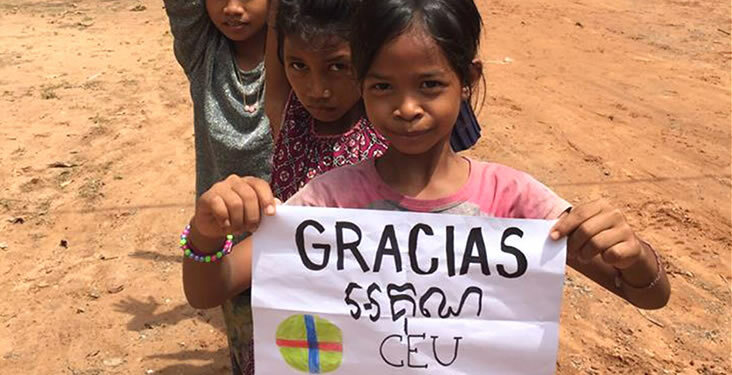 From the CEU centres, collaboration projects are co-ordinated with developing countries through aid campaigns both abroad and locally, summer programmes, seminars and field trips for students. CEU promotes all types of social action projects on a national level in the Volunteering Lecture Halls in our centres. From the Volunteering Lecture Halls collaboration projects are co-ordinated with developing countries through aid campaigns abroad. Based on the principles of solidarity, equality and social justice our aim is to impact positively on society in response to existing social needs. Aid to co-ordinate policies and join forces to achieve objectives that have an impact on society on an international scale. We would like to offer you the opportunity to join forces with CEU and work on some of our social action, solidarity or volunteering projects. We look forward to meeting you! Find out how in your nearest CEU centre.